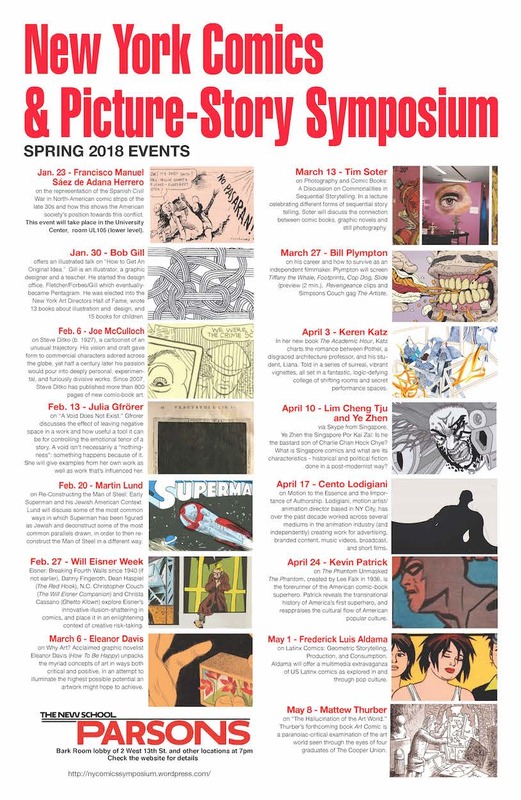 The NY Comics & Picture Story Symposium is a weekly symposium for artist/writers working in various text-image forms: comics, picture-stories, animation, etc. at which to present and critique current work. The symposium will examine new ideas for the distribution of print and electronic work that move beyond the existing models of publishing and advertising. We will re-examine the relationship between readers and autographic writers. Emphasis will be placed on self-initiated work and the development of a self-sustaining economic model for such work. Meetings will be facilitated by a rotating group of practitioners and guest speakers. The symposium will offer an ongoing place to learn and think about the traditions and future of text-image work. We meet at Parsons The New School for Design in New York City. Our meeting space is located in the Sheila C. Johnson Design Center at 2 West 13th Street, on the lobby level in the Bark Room, M101. The Symposium is hosted by the Parsons BFA Illustration program and the Parsons School of Art Media and Technology. All events are free and open to the public.